If you search you will find lots of stories of people successfully recovering from ME/CFS, Fibromyalgia, CRPS, PTSD, anxiety or depression. When people come across a success story from a person who once had what they are now suffering from there is often a very familiar response……. There are thousands of endings to this statement. Yeah but…..theirs was all in their head. Mine is real. The “Yeah But” is a wonderful way of staying exactly where you are. The fascinating thing is that I have seen people who have been sick for more than 40 years, or bed bound for over a decade, people on enough pain killers to kill a small elephant, people whose version of overdoing activity was talking or just opening their eyes for more than a minute and where the payback or consequence of overdoing it was months lying in a dark room, I’ve heard PTSD stories that are horrific, people with more specialists than friends, people who have outfoxed medical science by not responding to what ‘normally’ works. People who have long periods in hospital or tube fed. What is important is they all come to me having gone through hell and come with a long history of failed treatments. But they get to a place where they are ready to put all that behind them, to take charge and make massive change in their lives. In the application process I challenge them – Why the Lightning Process? What makes you think you can do do this training? It takes work and it’s not for everyone. There’s still work ahead for these people but it’s a ‘yeah but’ that is a stepping stone to change. What’s your ‘yeah but’? Choose wisely. Are you ready to join the pain revolution? There is a massive mismatch between what research now tells us about pain and the public perception about it. Given that we find ourselves with Chronic Pain as the number burden on human health AND a massive over-prescription of Pain medicine, is it time to join the revolution? Watch Lorimer Moseley’s discussion on the Pain Revolution below. One of the concepts of the Lightning Process is to use current understandings of how the brain and body interact to have a positive influence over our health. While we might be a product of our past we do not have to be at the mercy of it. Learning to engage in the PRESENT moment and our automatic responses, we can use tools to influence our mind and body. This opens up options that can increase our physical and emotional health. With focused effort we can look to retrain our brain to respond differently to the present moment – laying down new ‘automatic’ responses. While we may often feel at the mercy of our thoughts, emotions or beliefs, as Lisa Feldman Barrett points out in this TED talk on emotions – We are not at their mercy. An ‘Aha’ moment is a time when our understanding shifts and we change our awareness of the nature of our world. The science of perception is fascinating – how we perceive others, ourselves, our bodies, the world, our past, our present and our future. We are all biased YET we can work on correcting our biases. One of the key components of the Lightning Process is developing self-awareness of what we are doing in the present moment. It’s a skill to develop for the present moment is where massive change can occur. Unlike pure mindfulness meditation, where the aim is to merely observe, the Lightning Process uses self-awareness to allow intervention. Intervening in the present moment to retrain the brain to respond appropriately rather than historically. The understanding of NEUROPLASTICITY has become a valuable tool in working with both physical and mental health. NEUROPLASTICITY is the process where the brain alters its structure and function as an adaptation to experience. The implications of this are huge. One implication is that the things that people do to ‘manage’ their problem are also ‘experiences’ so the brain changes and adapts to management techniques. Another way to think about it, is that the brain of someone managing their illness well is very different from someone who is actually well. Many people think that they can ‘manage’ their way to full health. But they are different processes. A really great example of this is described in Norman Doidge’s book, The Brain That Changes Itself. Stroke rehabilitation specialist, Dr Taub realised that when someone lost movement of one arm, they naturally compensated and learnt how to function with the working arm. This however created changes in the brain. The parts in the brain involved in moving the stroke effected arm were not being used so disappeared as the brain’s neurology works on a ‘use it or lose it policy’. Meanwhile the parts of the brain associated with the still working arm increased in area. The person was in essence ‘managing’ their stroke by becoming really good at being a one armed person and the brain changed as a result of this. This is the Neurobiology of Compensation. Dr Taub therefore developed a novel stroke rehab technique called ‘Constraint induced therapy’. When someone loses the use of one arm, using their working arm makes sense but this has nothing to do with full recovery and can get in the way of full recovery. You are just getting good at becoming a one armed person. So ‘Constraint induced therapy’ for strokes now involves tying down the working arm. Any compensation activity (or management technique) changes the brain away from the where you want to be. Tying down the working arm forces people to focus on the aim of retrain the stroke affected arm. Think of someone with agoraphobia (fear of panic attacks). You can manage that well by staying inside the house. Great. Problem solved? No. Just well managed. This management technique is an experience that changes the wiring of your brain. Some areas that are not being used weaken (socializing, spacial awareness of the city, procedural memory of public transport, reduction of stress because you are ‘safe’). You get good at staying inside but you haven’t beaten the anxiety just managed it well. With good management comes changes in the body and the brain but you are stuck inside. So is the answer just going outside and pushing through the discomfort? Interesting – forcing yourself to go outside while you feel terrible also is an experience that changes your brain. The parts of your brain associated with detecting danger and threats get well developed, body awareness of sensations like a racing heart develops and the brain associates certain places with horrible feeling and stress hormones. The brains links outside with fear. Just pushing through doesn’t do it. So people often move back into the more bearable management technique of avoidance. You are not getting better just better at managing it. Avoidance or pushing through are not about getting better and over time these techniques change the brain. Paradoxically good management can become an obstacle to full health. People often assume the only two options with Chronic pain and fatigue conditions are also to either “push through” and pay for it or avoid the things that set them off. 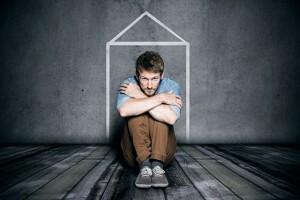 But if you think of the agoraphobia example, neither of these techniques are addressing the issue and are experiences that alter brain structure and function. When people come to me they tend to have developed a mixture of techniques between pushing through and avoiding what sets them off. The Lightning Process is suggesting an alternative option – to actively retrain your brain and body to respond more appropriately. You do have to be committed and focused but the brain and body are highly adaptable. The brain will adapt and get good at whatever you are doing. So the question is – Are you getting good at managing the problem or are you actually solving it? Stress hormones can keep us safe. But Chronic Stress hormones can make us sick. A nice overview of how chronic stress changes our body. The problem is not stress it is CHRONIC stress. Our body starts changing instantly with stress. We are designed to respond to a threat with the Physical Emergency Stress response. But long lingering periods of running a Stress Response begins to negatively influence our health. This is one of the things we focus on with the Lightning Process – teaching people how to spot and turn off this Physical Emergency Response. There is more to the Lightning Process than just learning to relax but its a powerful start to be able to consciously take charge of the moment and calm the body. August 7, 2017IanChronic Fatigue Syndrome & MEComments Off on What is fatigue? It’s worth pondering if you are suffering from chronic fatigue that rest and sleep USE energy. Lying still uses energy. Sleeping uses less but only a fraction less. It’s still ‘draining your energy resources’. It’s interesting to ponder that healthy people wake up each morning having used energy to sleep but feel more ‘energised’. There is a difference between the energy in our body and how ‘energetic’ or fatigued we feel. Fatigue is not running out of energy. You won’t rest your way out of chronic pain or fatigue. Challenging the way we think about chronic pain and chronic fatigue can be an important first step to recovery. The video below is a useful way to think about just how the brain processes all the information that comes its way. With the brain located inside our skull it relies on our nerves to send it important information. This includes information about the world around us and the working of our body. All of this information is sent along nerves / spinal cord to the brain but not all of it is important. This information goes through a filtering process so only vital information gets to the brain. But what determines ‘vital’? Any perceived dangers will take priority. We are alert to ‘threats’. If we incorrectly think a safe thing is dangerous this will alter how our brain works and how the body responds. What would it be like to train your brain about what is important and what is not. What to pay attention to and what to ignore. While this video perhaps focuses on one important element – focus – our Reticular Activating System is influenced by many things including past experience, trauma, beliefs, emotions, words we and other use, memories, conversations and who we hang around. This Reticular Activating System is integral to our awareness of the world, our sense of self and how we respond to things AND it can easily be trained. Think about how this might be useful is understanding elements of anxiety conditions, depression, self-esteem as well as pain and fatigue conditions.